I finally finished my new maze book, and now you can buy it from Lulu.com! It took a while to hand-draw all these . . . It's been about a year since Tile Cascade came out for iOS. In celebration, it is now available for FREE on the . . . Here's something interesting. To understand the true size and scale of things in space, have a look at this . . .
More Blog Posts . . . Enjoy the maze books available from Bradshaw Creations. Mazes come in all shapes and sizes and difficulty levels, so there should be one that's right for you. Bit Grid is an iOS for building logic circuits. Build adder circuits, two's complement circuits, and many more. A new blog for beginners wanting to learn computer programming. Starts with the basics of Python and works its way up. More Projects . . . Solve large mazes in the new book of mazes hand-drawn by T R Bradshaw. Different solving strategies are necessary to get through all of them. Build logic circuits in the new app for iPad. Connect values, gates, and circuits together and discover how computers work at a fundamental level. If you want to learn computer programming, this is the blog for you. No previous experience is required because it starts at the very beginning. A new collection of mazes is available from T. R. Bradshaw. Each maze was drawn by hand (as opposed to created by computer) and scanned into this book. All that remains is for someone to solve them all! Most of these mazes are straightforward: enter by the in-arrow and exit by the out-arrow. Some mazes include special secrets, like keys you must collect in order to escape. These mazes come in various shapes and sizes and levels of difficulty; start off with the easy ones, and then tackle the trickier ones when you're brave enough. * Now available at Amazon! I finally finished my new maze book, and now you can buy it from Lulu.com! It took a while to hand-draw all these mazes, scan them in, clean them up, and then put them all together, . . .
T R Bradshaw's Maze Book Volume 1 now on Amazon! 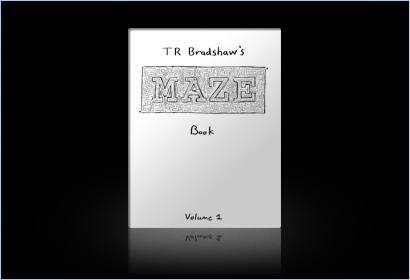 T R Bradshaw's Maze Book Volume 1 is now available! Tile Cascade App is now available for FREE!